In January, Angus Genetics, Inc. (AGI) announced the release of research Claw Set and Foot Angle EPDs. The development of a research EPD is the second step towards a production EPD. This followed research presented in the summer of 2017 which found heritabilities of 0.34 for foot angle and 0.21 for claw set. Estimating heritability (portion of the trait influenced by genetics) is the first step towards a production EPD. This research also found a genetic correlation of 0.22 between the two traits, indicating that both traits need to be reported and analyzed. Between herd variation, just like any other trait, is handled through the use of contemporary group effects in the EPD analysis. Thus, the main focus is consistency within a herd year after year. The American Angus Association also has partnerships with university judging teams to aid in foot scoring. Figure 1. Genetic trend for Claw Set EPD in highly accurate Angus sires. Blue line is a linear trend. 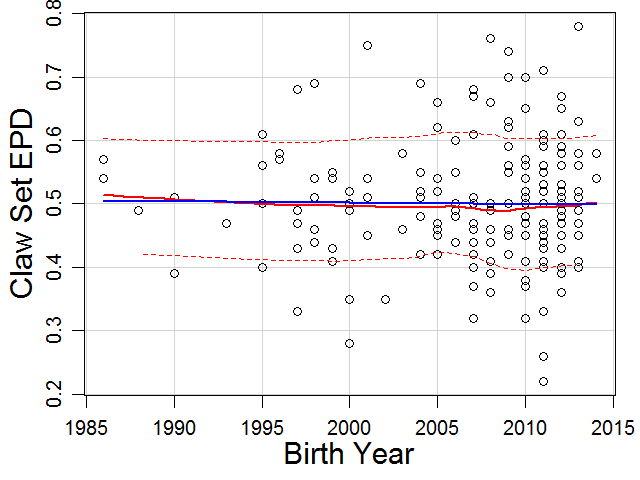 Red line is a smoothing curve (Loess regression). As seen in Figure 1, claw set has basically remained unchanged in Angus cattle since 1985. This may be due to the lower heritability of claw set or less phenotypic selection on claw set. An EPD should help improve the rate of genetic progress for claw set. Figure 2. Genetic trend for Foot Angle EPD in high accuracy Angus sires. Connealy Counselor, an outlier with a Foot Angle EPD of 1.20 was excluded from this graph. Blue line is a linear trend. Red line is a smoothing curve (Loess regression). If we compare the 30 years from 1985 to 2015, Foot Angle has also not changed in Angus cattle. However, we see foot angle getting worse from 2003 to 2008, at a rate of 0.013 units per year. However, we see improvement in foot angle from 2009 to 2015 at a rate of -0.016 units per year. This may be due to the ease of phenotypic selection for foot angle or the increased response to selection due to the higher heritability for foot angle. The American Hereford Association uses subjective scores to report Udder and Teat EPDs. They began publishing production EPDs for these traits in 2015. 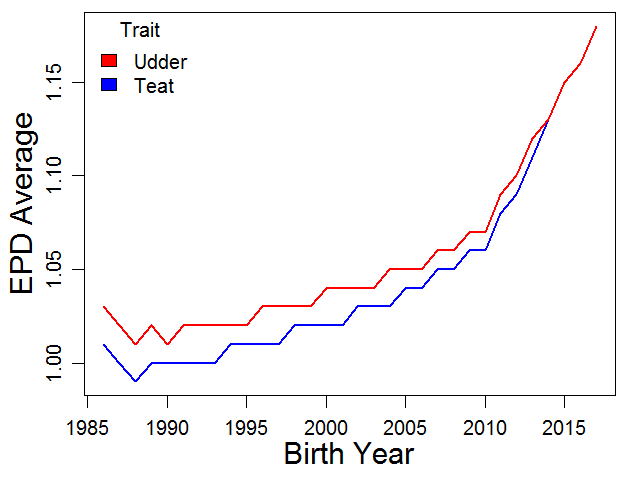 The genetic trend for both of these traits began to improve more rapidly in 2010 likely due to systematic recording and reporting of udder and teat scores in 2009 (Figure 3). These results show how important data collection and reporting are for genetic improvement. Further, this illustrates that subjective scores, when properly analyzed and used, can effectively improve economically important traits. Figure 3. 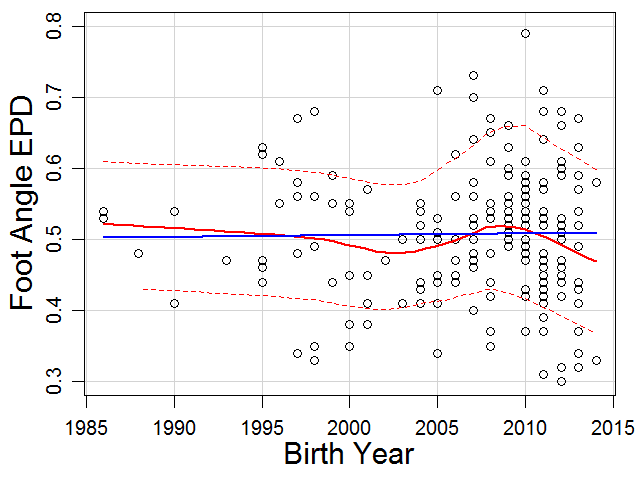 Genetic trends for Udder (red line) and Teat (blue line) in the American Hereford Association. The press release pointed out that these were the first foot score EPDs in the U.S. beef industry. Angus made this distinction because the dairy industry has been reporting structure genetic predictions for quite some time. The Australian Angus Association has structural soundness genetic predictions for Front Feet Angle, Front Feet Claw Set, Rear Feet Angle, Rear Leg Hind View and Rear Leg Side View. Breed associations in the U.S. are also working towards structure EPDs. Tommy Perkins, International Brangus Breeders Association, explained at the 2017 Texas Beef Cattle Short Course several subjective scoring systems Brangus breeders are using to record and report data. These include a 1 to 5 scale for foot angle and claw set. Bob Weaber, Kansas State University, provided an update on structural soundness research being conducted at KSU in collaboration with the Red Angus Association of America. Commercial cattle farmers and ranchers can utilize crossbreeding to complement the strengths and weaknesses of different breeds. Seedstock producers and commercial operations that straightbreed need to look for avenues of genetic improvement. This frequently requires the recording and reporting of data to produce EPDs that increase genetic improvement. At the very least, this requires systematic recording of these traits to increase attention to their impacts and expression. Beef producers, especially seedstock producers, should learn at least two lessons from these developments.